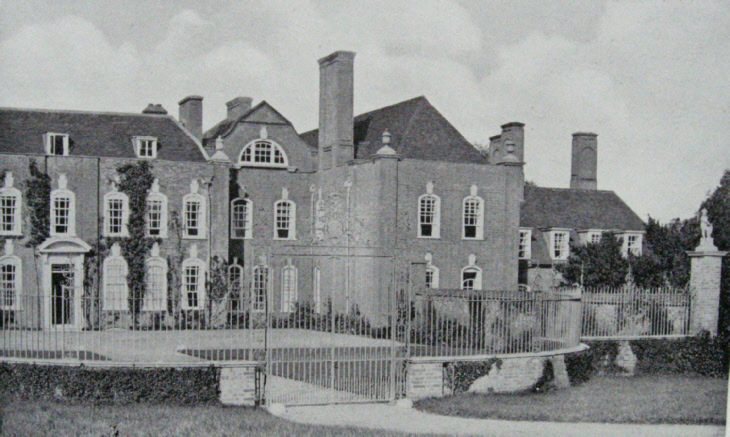 The eighteenth-century incarnation of Temple Dinsley was built in 1714 as a manor house for Benedict Ithell. 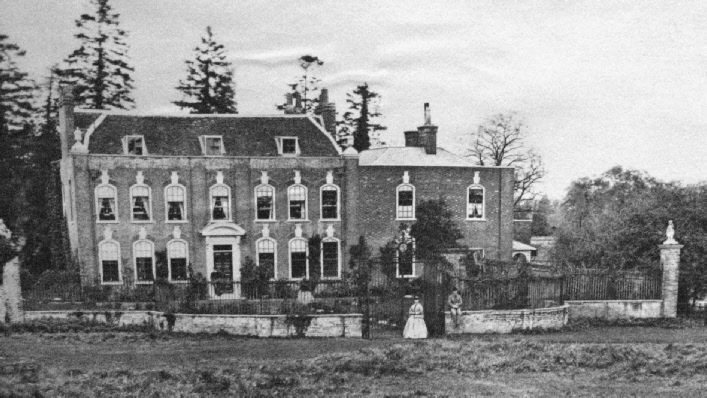 It was on the site of an earlier mansion and was a “modest....house facing natural park land”. 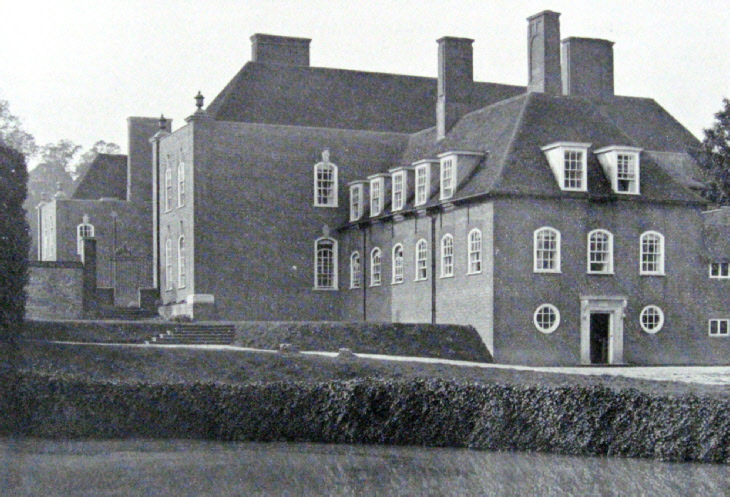 In 1908-09, Lutyens was commissioned to remodel and enlarge the house and then add further extensions in 1911. The challenge was to ‘maintain with pious care the ancient fabric’ and not dominate the old house with the extensive alterations. His central idea was to retain the presence of the existing mansion by adding symmetrical long, two-storey cross-wings which completed an H-shape. The wings were linked to the old house by recessed blocks of two-storeys that incorporated attics with a prominent Dutch gable to the north and south. 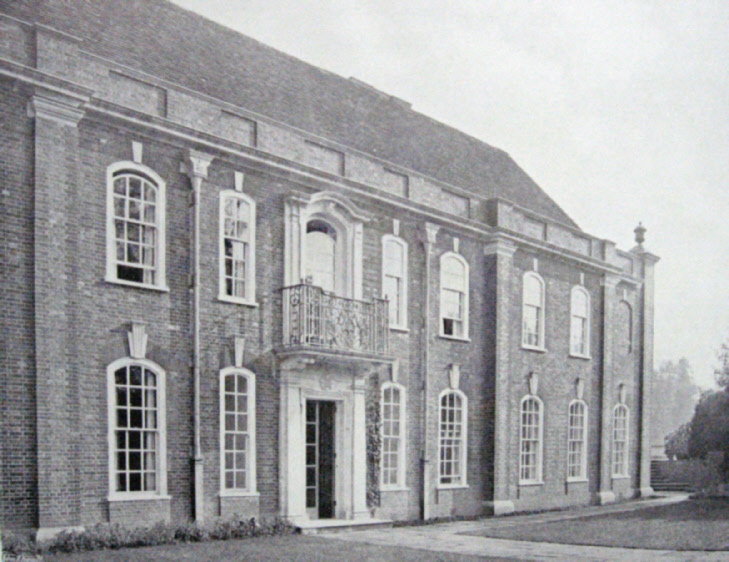 The form of the gables was an echo of the cross-wings of the pre-1714 mansion which is depicted in a seventeenth-century engraving (see link: Engraving).The original windows of the Ithell house, with their exaggerated keystones, were duplicated around the new house and at the corners of the mansion, Lutyens added tall pilasters, capped by urns. The 1714 house was built in red bricks using the Flemish bond - rows were of ‘header’ bricks followed by a ‘stretcher’. 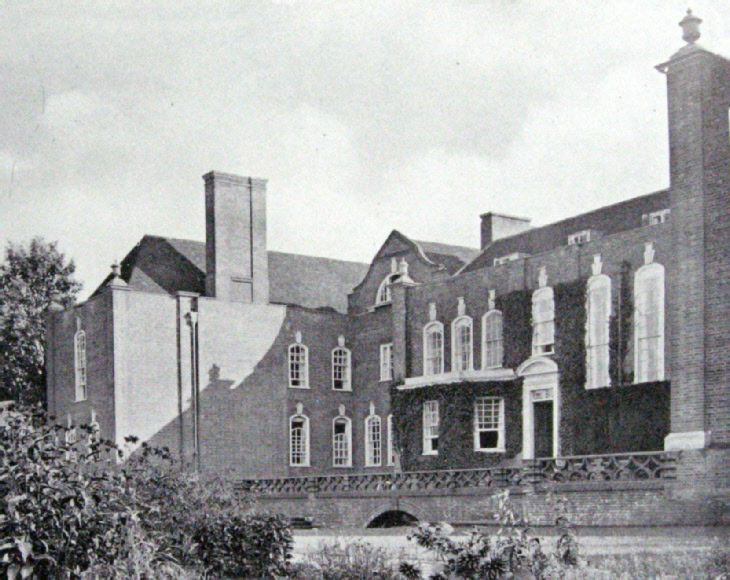 However, Lutyens, although using red bricks with lighter red dressings, used the English bond for his additions - alternate rows of ‘headers’ and ‘stretchers’. The main living rooms in the new west wing faced a rising terraced garden and as the ground to the east fell away from the mansion, a servants’ wing was unobtrusively added at this elevation. The resulting mansion is thought by many architects to be a satisfactory re-modelling. Despite being three or four times the area of the original home, the wings do not appear new and overwhelming. ‘The old work has been respected in all faithfulness and the new rhymes with it delightfully but does not fail of showing the individuality of its creator’. 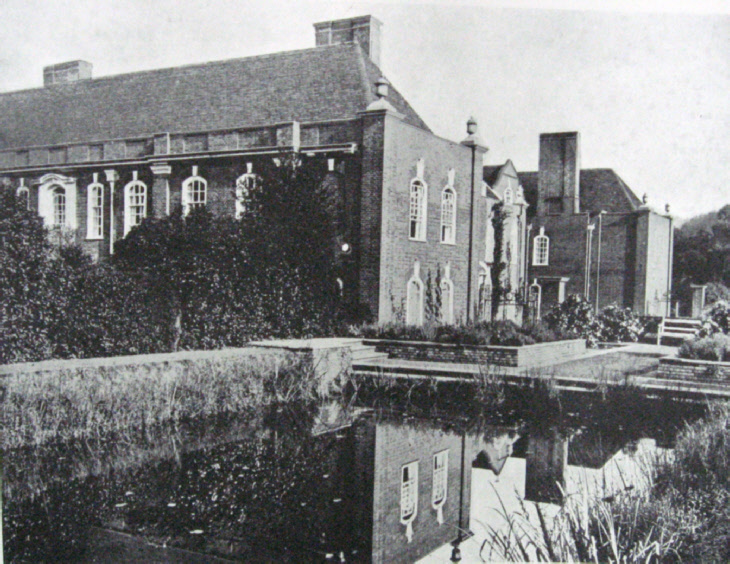 As part of the Temple Dinsley estate, Lutyens also designed a piggery (shown above circa 1913) - a simple farm building which demonstrated his ability to transform service structures into splendid display of architechtural form’. It was built with red bricks and handmade red roof tiles. Also, designed by Lutyens was the park wall which surrounds the estate. It was approximately 1.75 metres high and built with plum bricks in English bond. It is topped by half-round coping bricks above a sloping scarcement. The brick craftsmanship has been described as ‘excellent’. 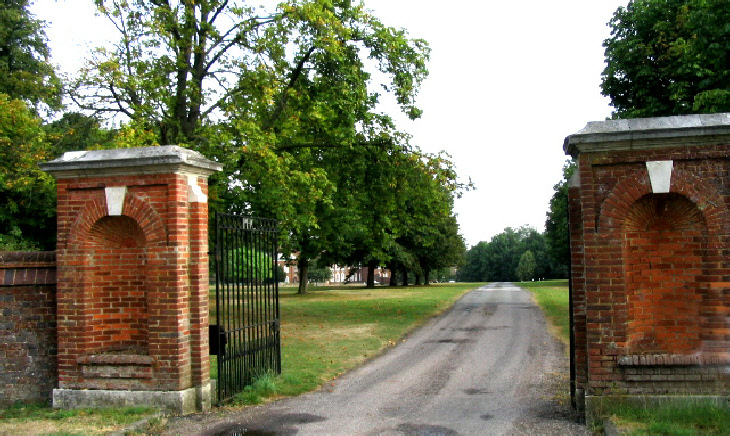 The Crunnells Green entrance to the estate (below), also designed by Luyens, features two pairs of gate piers which are built of narrower and light red bricks. The piers have a projecting stone plinth and are capped by an overhanging stone moulded cornice. They have recessed spandrels with a keystone to the arch. 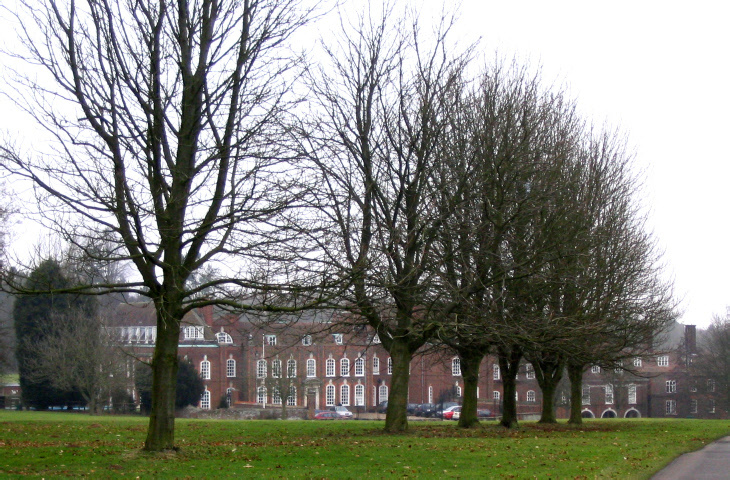 Above, Temple Dinsley (now Princess Helena College) viewed in 2003 from the entrance gates.